THE four-star Western House Hotel at Ayr Racecourse swept the boards at the Scottish Hotel Awards in Glasgow recently, picking up six ‘gongs’. It is the biggest awards haul ever for the prestigious hotel, which celebrates its seventh birthday this weekend. 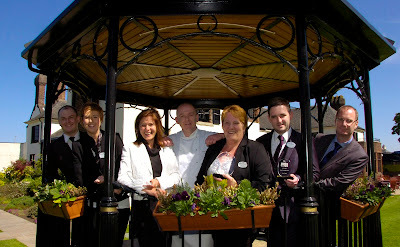 The Scottish Hotel Awards are dubbed the Oscars of the hotel industry, and picking up the spoils for Western House were general manager Malcolm Balish who won the General Managers Gold Medal, Jean Kerr who was awarded the Senior Wedding Planner Fellowship, Adam Young who was presented with the Rising Star Hospitality Medal, and Gary White who won the Rising Star Future Manager. And in addition Western House won both the Wedding Team of the Year and the Reception Excellence Gold Medal. Malcolm Balish summed it up when he said: “We travelled to Glasgow hopeful of maybe collecting one or two awards after we learned we were nominated for several, but to come away with six was way beyond our expectations. “I am so proud of everyone on the team who put in so much effort to maintain the very high standards we have set at Western House Hotel. “The Scottish Hotel Awards are the benchmark for the hospitality industry in Scotland, and to do so well means a lot to all connected with Western House. Its hard to believe that just over seven years ago Western House housed the Racecourse offices, and now it’s one of Scotland’s top hotels.